Fimmvörduhals eruption phase of Eyjafjallajökul 2010. Photograph by Boaworm. What happens when an unstoppable force meats two unmovable objects? Well, in the world of geology there should be volcanism. It is a jolly good question from a science refusing flat earther. Because there should be a lot of volcanoes in Norway. Time to answer the question: Why are pyroclastic flows not pining for the fiords of Norway? The unstoppable force is obviously the Mid Atlantic Rift (MAR) in general and specifically Iceland. The two unmovable objects are the two largest tectonic plates on Earth, the North American Plate (NAP) and Eurasian plate (EAP). At least the NAP and the EAP should be unmovable, but they are not. About 14 million years ago the started to spread apart, even though simple mechanics says that they should be moving towards each other. We do know the rough date for two different reasons. One is the trail of calderas across the snake river plane that has done a horse-shoe shaped U-turn with the trail leading to todays Yellowstone. In Norway at that time a very prolonged time of uplift started, so far, the country of lusekofter, goat-cheese and people on skis has uplifted an astonishing 1000 meters. General view. Red area is heavily uplifted. The area across Denmark and southernmost Sweden is a slow spreadcenter. Image from Bo Holm Jacobsen. So, what else happened 14 million years ago? Well, Iceland did. At that time the high-rate volcanism at Iceland started, and a mantleplume started to form from the surface of the mantle burrowing ever deeper. After a while this started to buckle the earth and a dome formed under Iceland lifting it up 54 meters. And gravity being what it is, the newly formed land started to slide down this bulge. And since we are talking about oceanic crust it should be quite happy with sliding down under the Baltic Shield and Scandian Craton. And in the beginning it looked like it would do that since the EAP did not change trajectory immediately like the NAP did. West of Norway a depression started to form called the Norway Through, it ended up being two kilometres lower than the surrounding seafloor, and towards Norway it has a nice subduction like profile. This buckling depression caused a simple effect with far reaching consequences, because if one place is pushed down, another must rise. And in this case the area being uplifted is a large portion of Norway. In the end this buckling will cause a break in the oceanic crust and a mega-thrust fault will form as subduction starts. This has not yet happened, and it will take quite a bit of time since the oceanic crust is buckling against the Scandian Craton, the worlds second oldest piece of continental crust. Not only is it old, it is also unusually cold, hard and deep. To further complicate things it has also been reinforced by massive iron intrusions. Think of it as concrete with massive amounts of rebar. In other words, it will take the depth and angle of the Marianas Deep before it starts to subduct. P-wave anomaly. Red indicates magma. Image from Bo Holm Jacobsen. There is though a second part of the story to why it will take time before subduction starts. And that is that Iceland is happily pushing the EAP to the ENE. A large portion of the push exerted by Iceland is taken up by this motion. It has also started to move the Scandian Craton in a slightly different trajectory going NE. This last part has caused strain to build up between the Scandian Craton proper (Norway and Sweden) and the Fennian part (Finland and the Kola Craton) of what is called the Baltic Shield. The end result of these two slightly different trajectories is that a transform fault has formed between northern Sweden and Finland. Bouger gravity anomaly chart. Blue indicates warmer less dense material. Image from Bo Holm Jacobsen. The movement along this transform fault is not that large, just a few millimetres a year, but if Iceland remains active the pace will pick up over time and the Scandian Craton will be pushed north of Russia. This movement have other effects, for one it causes southern Sweden, Denmark and northern Germany to sink. It has also had dramatic effects on the Sea of Bothnia where parts are being pushed up (the High Coast). Now, why is this interesting? Well, The Baltic Shield has looked the same for as long as we have had continents, every single supercontinent for the last two billion years have had the Baltic Shield staying the same. It has just been to strong to be broken up, until Iceland came into being that is. It has cracked the uncrackable safe open. But now we need to get back to those lost Norwegian volcanoes. Now that we have learned that we will have to wait for quite some time for subduction to start under Norway, if ever, it sounds like the Norwegian volcanoes will not happen. But, that is not the case. As Norway is pushing upwards it is causing decompression melt intruding as a crustal delamination at depth, or the formation of a large magmatic body under the crust. It is unclear which of the two is the case, with a high probability that both are happening at the same time. We can see this enormous body of magma clearly on tomographic imagery. Even though the uplift is minute per year (1cm every ten years), the area is so large that the total amount of magma flowing in is between 5 to 10 cubic kilometres a year. This buoyant hot liquid is ever so slowly burrowing its way upwards to the surface. It still has quite some ways to go, but sooner rather than later it will arrive to the surface, and the effect would be rather stupendous as it happens. Even if only 10 percent of the available magma would be released it would conservatively amount to seven million cubic kilometres of lava pouring out. That is a lot of lava pining for the fiords. The end result would be something like the 2-million-year cyclic ignimbrite flare-ups at the Altiplano-Puna Volcanic Complex. Whenever it happens I would not want to be around Norway, but it is obviously quite some time into the future. Geiranger – The perfect place if you are pining for some future pyroclastic fiord surfing. In the end the backends of NAP and the EAP will be locking together and their respective motion will stop as they turn into a single large unmovable block. That is the moment that subduction will start to take place under Norway. This is roughly 1 million years into the future. What we have not talked about is the North American side of the Icelandic push-train. Interestingly there is a corresponding action occurring there with large amounts of magma residing under New England and the Southern Canadian Atlantic Coast. The continental crust here is an easy pushover compared to the steel reinforced behemoth of the Scandian Craton. This means that the onset of volcanism here is closer, but if that will happen in 10 000 years’ time, or in 1 million years is unclear. This model has quite a few uncertainties in it. How far NE can the Scandian Craton go is the main one. But in the end this has some real world ramifications for the present. For instance building codes in the Northern half of Sweden will have to start to incorporate earthquake proofing. The same goes for Norway. Currently the Swedish historic decadal earthquakes are ranging up into M4.5, but there are geologic evidence for millennial earthquakes ranging up into the M6 range with centennial M5 range earthquakes. The figures for Norway are roughly the same, but the earthquakes are a bit larger, but further out into the sea. So, any destruction would be roughly the same. Those dreaming dark dreams about seeing Norway and Sweden being blown towards Saturn, or New York being covered by ash will have their dream fulfilled, but on a timescale that makes their dreams into a moot point. Personally, I find the idea that something so massive and hard as the Baltic Shield being able to break up due to Iceland to be immensely satisfying. But, I love all sorts of esoteric knowledge. On a completely different tack, plate tectonics is the best proof that the earth is indeed a sphere. The flat earthers believe that Earth is a round disk. But, if that was the case plate tectonics would either have started at a very slim disk over the equator, or if it was round to begin with it would have become quite fat around the equator by now. And the evidence for plate tectonics is just everywhere in nature to be found. Another thing that no flat earther has been able to answer is how volcanoes form on a thin coin. Where is the magma coming from? Problem with the flat earthers is that they do not understand that to prove their theory they would have to replace all sorts of science with alternative and better theories. And that in scientific fields they have never even heard of. And while I am heckling them, I have a final question for them. Why have not a single one of them bought an airplane and flown it due west along the equator? After all, that would prove their theory as they fell off their coin-world. But, I guess their fevered minds would come up with some mysterious ad-hoc theory as they after a while landed at the point they started from. After all, they are impervious to basic logic and learning. Is it really only going to take about 1 million years for subduction to start though? That sounds a bit quick for something on that scale. Unless the existing Norway trough is less than 1 million years old. SUPER VOLCANO UNDER NORWAY!!! will appear in a few days..
BTW great article and explanation , Carl..
1M years seems ever so fast to me. I might have believed 10MY but 1MY is, like, tomorrow in geologic terms. After all the Atlantic has been growing for 65MY without causing too much bother in europe (unlike africa, which has been annoying). If the birth of the new volcanic arc was literally about to occur, what would happen and how would be able to tell it was imminent? It’s an interesting thought…. Also, is there any sign that volcanism could return to Britain at some point in the future? The effects? Lots of reverse fault focal mechanisms as the oceanic crust-continental crust interface begins to fracture. How a new subduction zone would look in the beginning is an interesting thing to ponder. The short answer is that we do not really know, but it would be fun to write an article about what may happen. The UK is rather boring from a volcanic standpoint. Nothing is pointing towards renewed volcanism there in the foreseeable geologic future. Interesting question. There are two separate things here. The craton can spit through rifting, and that has happened a number of times here. Originally, of course, it was merged with Greenland and the Canadian shield. It split without any subduction being involved, at least not on the Atlantic side. The rift between Canada and Greenland split the continent but never became deep ocean. Between Norway and Greenland it did. There is an older rift underlying Oslo which didn’t split Scandinavia. But is it notable that when a split happened, it was at nearly the same position as a previous split. The Caledonian mountains formed when an older ocean came together, so it traces an old split. It resplit when the Atlantic formed, leaving half on the European side and half on the American side, but both side very close to the coastline. An old merger remains a weakness. Subduction does not split a craton near where the subduction happens, but can cause a rift much further away. Presumably that happens when two opposing subduction zones pull the continent in opposite directions. The Lake Baikal rift would be a prime location for this to happen. Cratons are not particularly resistant to splitting. See the Red Sea which is a split through the heart of an ancient craton. 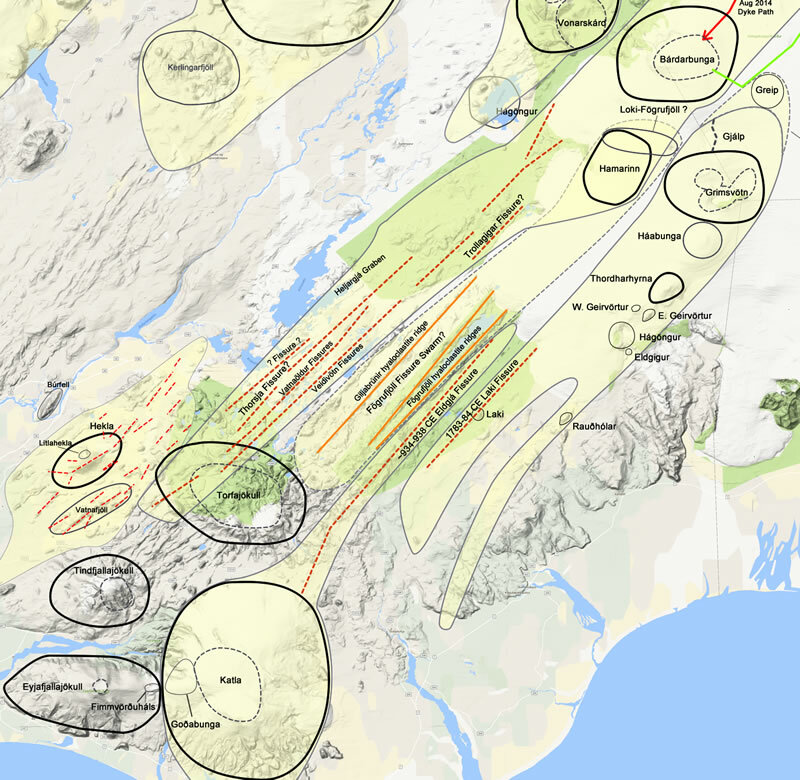 The main evidence for resistance is part of the African rift valley which goes around the the heart of its craton – on both sides. The Norwegian sea is a funny one. The bit at the southern end of Norway is not part of the Atlantic ocean and is not actually oceanic. As continental material, it can’t really subduct. You expect the subduction to begin at the edge of the continental shelf: off the coast of Portugal it is already getting close. The northern Atlantic is still a bit young for this to happen: give it another 50million years. The main danger for Scandinavia, though, is rifting. So indeed, when volcanoes pop up they will be of the flood basalt type. There is a very weak rift under France and Germany, ending in the Eifel and caused by Italy. If that extends further towards Oslo, things could get quite interesting. I wonder how long it will actually take for volcanism to start in these areas. Both the magma body under Norway and the one under the eastern US are in area far from any volcanoes today, but could both erupt within the near geological future, and the one under norway could be a big one. It almost seems like we missed out on a real show 😉 Maybe the first eruptions could be kimberlite eruptions or something similar, before more substantial activity a bit afterwards. Im sure you guys know the writers on there, with them being formerly frequent commenters and probably lurkers up to today. There was a point brought up that the type of lava nyiragongo erupts (foidite) is commonly associated with flood basalts, and the area is a rift that has been pushed up 1.5 km, with two very active volcanoes that erupt basically every year and often on a significant scale. Maybe in the near geological future (probably much less than 1 million years) there could be large effusive eruptions here too. Naturally I found this interesting, but there is also not a lot of info about this given that until recently it was dangerous to do long term study. Still something significant and worth of a discussion, either here or on there. The start of subduction probably would look like the fault zone south of New Zealand, which has started subducting recently but not for long enough to become volcanic. At an even earlier stage there is possibly the diamantina fracture zone south of Western Australia. It is usually classified as a rift fault from when the southern ocean formed, but it is over 7 km deep at some points, and is actually the deepest part of the indian ocean and deeper than the Java trench. The area was extensively mapped when looking for the wreckage of that plane that crashed there, but apart from that there isn’t much else known, and I wouldn’t be surprised if it is a developing subduction zone. You don’t just get random holes that form >2 km below mean ground level in a rift zone, otherwise there would be deep holes all along the coast. The crust isn’t extremely old there, but subduction zones exist in the Atlantic using crust of a similar age, so it’s not impossible. I’d be interested to know how the above is also affecting the British Isles. Parts of the UK do experience regular seismic activity, especially the west; these are mostly weak but occasional earthquakes do occur exceeding 5.0 M. I wonder if the magma body may be slowly developing under parts of the UK. UK tilt is due to Isostatic recovery. Volcanics long dead but residual heat still under Cornwall and (surprisingly) under the Whin Sill – the latter mostly due to chemical reactions than magmatic memory. Well, there used to be volcanoes. However, after the government introduced the subduction tax, they all moved to tax havens in the Caribbean. Regarding your map with all the vectors for tectonic movement from JPL, the density of vectors in North American and Western Europe has to be an artifact of higher higher monitoring, so more data, rather than higher activity, right? No way is the US East Coast more active than, say, Indonesia or Japan. Yes there are more stations, but it is not the amount of arrows that says if a place is active or not, it is the length of the arrows. If you look again you will see that the NAP and the EAP have loads of short arrows, but that south America and other areas have longer arrows indicating for more movement. A mantle plume below Norway causing uplift of the Caledonian structure there, just like a mantle plume below the Variscan structure caused the uplift of the Rhenish Shield and volcanism of the VulkanEifel region. But why hasn’t magma below Norway broken to the surface yet, in contrast to the magma below the Eifel region which has already broken to the surface several times? More about magma below Norway, see http://www.mantleplumes.org/Scandes.html “Testing the Existence of a Mantle Diapir Below the Southern Scandes”. New magma recharge event? The summit lava lake is about as high as it can go without overflowing, and pu’u o’o has already inflated to a level well beyond what it took for the 61f/g breakouts to happen, I wonder if a new larger breakout somewhere is due, rather than the expected small superficial breakout from pu’u o’o. If I recall the exact same thing as what is happening now was happening in 2011 before the kamoamoa fissure started, only now the summit lava lake is much bigger and both the lake and the crater floor of pu’u o’o are at a significantly higher level than in 2011… Kilauea about to return to the news headlines? The swarm seems to have ceased. My suspicion is overfill of the Pu’u’o’o magma chamber. 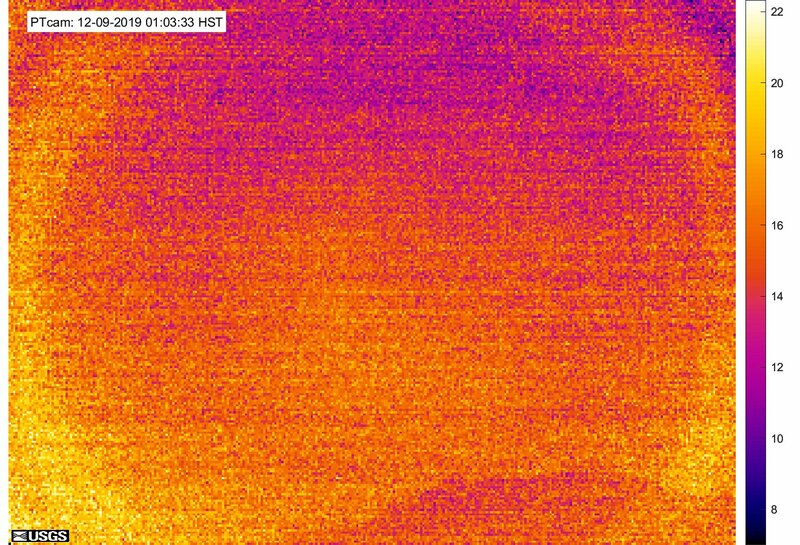 Over the past few days it has been responding in reverse to the DI events at Kilauea, suggesting the pressures in these connected chambers are becoming equal. Something somewhere will break. But it may be underground and never show itself to us. Pu’u o’o is still at a lower elevation than the summit though so assuming nothing happens otherwise, the pressure will equal out with a breakout at pu’u o’o or maybe all the lava from the summit will just drain out through the dyke to pu’u o’o suddenly and cause a surge there, whatever that is. More magma must be arriving than is being erupted at the 61g vent or there wouldn’t be a lava lake at the summit that sits at several hundred meters higher elevation. There is a part of kilauea’s southwest rift zone that is above where it intersects the koae fault zone that magma often intrudes to before stopping. There are volcanic cones here that erupt relatively evolved magma for a shield stage Hawaiian volcano, something almost in the range of basaltic andesite. The intrusion after the lava lake overflows in 2015 ended up in this area. Eventually an eruption is going to happen here, if it happens while the current eruption mechanism is in place then for the first time in the recent history there would be eruptions occurring on all three major eruptible areas at a significant distance from each other. But that will have to wait and see. I would say this is pretty substantial uplift of the crater floor. It used to be completely flat and lower down, and given that the crater is like 150×200 meters wide or something like that, this is pretty big – at least meter scale. 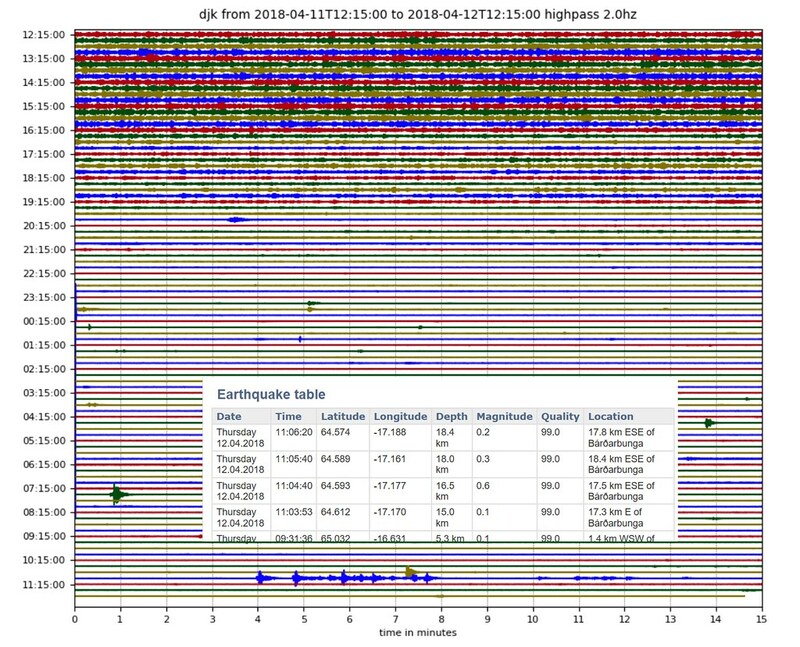 One of those relatively rare earthquakes here in south Sweden struck just outside of Gothenburg where I live just a few years ago in july 2015. If you look out your window you will see the world is clearly concave, not flat. Just look up. Everywhere you look you will see the curved roof of the sky – blue, grey or black. depending on the time of day and weather. Common sense dictates that if everywhere above us is round, no matter where we are in the world, we must live inside the hollow of a round ball, around which the sun and stars rotate. Of course this was obvious even in ancient times. The problem is that to the eye, the sky above looks much closer than the horizon, even though both are some 10km away. The eye needs something to give an idea of scale, and looking up there isn’t anything. That is the reason the earth looks like a flat plain to us. Not quite the same, but I like this illustration how context can affect what we see. 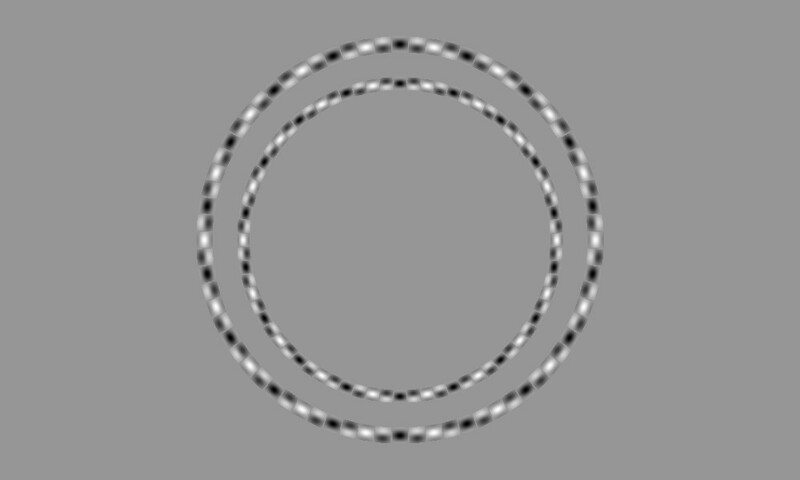 These are two concentric circles – believe it or not! A matter of resolution. The illusion is caused by the details of the black/white pattern. If you look away, or squint, you see much less sharp (sharpest eye sight is straight ahead, while the periphery is seen in less detail) (and without colour). 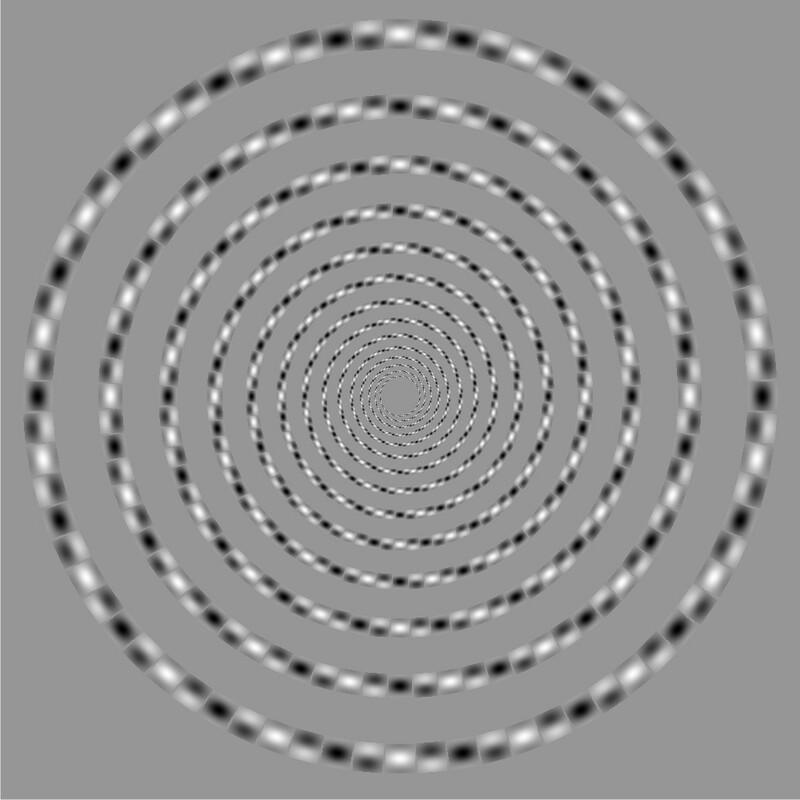 The pattern in the black and white becomes fuzzy, and the rings become concentric. Or this one. It is not a spiral – no matter what your eyes tell you. Disturbing. To paraphrase an axiom, seeing is deceiving. The fissure swarm, beyond the ice cap, doesn’t appear to have been active for a while (post-glacial) and the recent large rifting events have happened either side of it. The hyaloclastite ridges that make up this fissure swarm imply a sub-glacial origin. Are we seeing the eastward jump in main rift action here (on to the Grimsvötn fissure swarm and eventual death of Veidivötn-Bardarbunga) or is the time resolution too small and I’m just seeing a pause in one of the deadzone rifting four (Katla, Grimsvötn-Thordharhyrna, Veidivötn-Bardarbunga and Loki-Fögrufjöll)? I can find very little info on this system(s), as they might be separate entities to some degree, and what is the parental role of Bardarbunga in it all – There’s a ridge extending from Bardarbunga into Hamarinn. After all, Hamarinn is assigned to Bardarbunga in most of the recent papers. Likewise, is the Loki ridge Grimsvötn’s westward limb into Hamarinn? Will it continue to slumber or will this system be next in the series of Holocene large rifting events? The most likely reason for the recent gap is Hamarin itself. Magma does not like flowing uphill. If there is a hill in the way, even magma in an underground dike will try go around it: the dike will follow the contours of the land. The Holuhraun eruption took this to extremes: at every point on the way, the dike took the steepest contours of the land, and it stopped (and erupted) where it could no longer do this. Hamarin may be blocking the way for the dikes from Bardarbunga, forcing them to go west. The holuhraun dike could have turned south rather than north: at the point where it turned 90 degrees, there was a significant chance it would have gone the other way, based on the contours. In that case the Holuhraun eruption would have been in the Laki/Eldgja area: same region but different feeding volcano. This map really puts laki and eldgja into perspective… Two eruptions probably covering the same amount of ground as all the other historical eruptions put together (maybe not quite). Interesting how there are no significant lava flows coming from veidivotn in historical time, but quite a significant amount of lava in prehistoric time, maybe that shows the climate changing to be more wet in the last 1000-2000 years, or that eruptions there are just not as big as we thought. 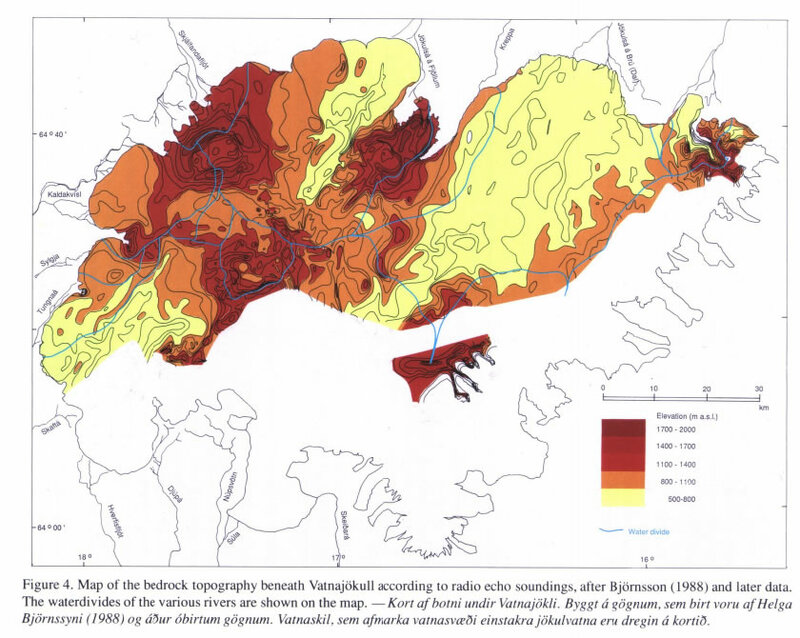 Maybe holuhraun was actually not significantly smaller then the 1477 eruption, just more compact and not as fast. Previous large lava flows at Veidivotn blocked the river there and caused the formation of the largest Icelandic lake. Then the ashy eruptions started at Veidivotn, at least the last two. Nowadays the region still sees the remains of that lake, now hundreds of small lakes with the lava flows in between. Would that mean the next eruption there is likely to be primarily ashy like the last one, seeing as the area is still waterlogged, or would that amount of magma just boil off the water and erupt mostly as a lava flow. I would expect it to be ashy but holuhraun erupted through wet ground with no ash at all so I might be mistaken. I guess with an average of ~500 years between events the next one might be not that far off. I can perhaps answer that question, at least partially. The Ridge of Fögrufjöll is not a ridge, it is the volcanic system of Háagöngur, not to be confused with Hágöngur. 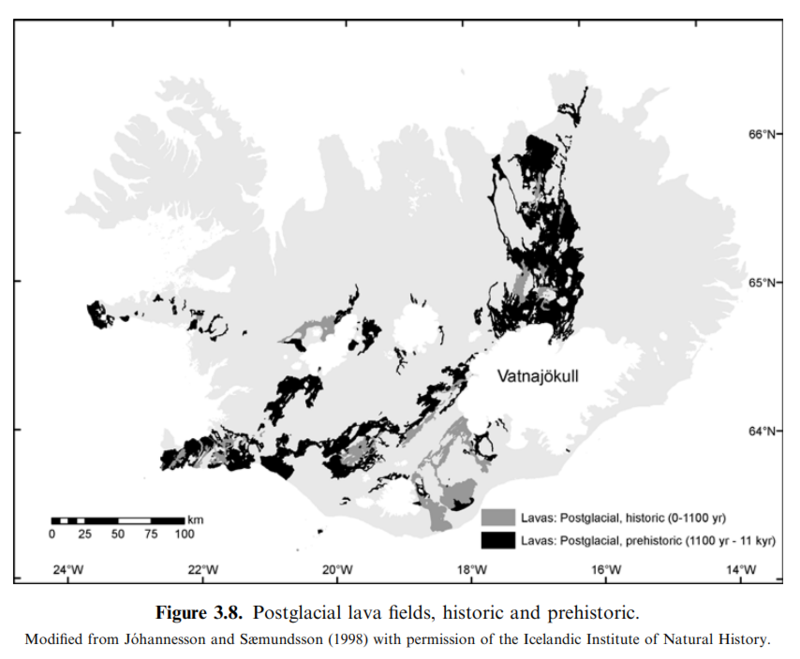 It is interesting for many reasons, one of them is that it had an almost never mentioned VEI-5 eruption at around 1300 as evidenced by boulders and ash found all over the glacier (and the rest of Iceland). Judging from the size of the boulders it hurled it was probably quite a memorable but short event. Think a Kelud style eruption, but on the scale of Cerro Hudson. Probably it lasted for just an hour or so. Why it is not that well known is that it for unclear reasons are not in the writings from the time, but the glacial evidence is there anyway. Probably it happened during the night and the resulting ash took a trajectory over unpopulated areas of Iceland. My idea is that this powerful eruption caused damages to the fissure swarm itself, and that this has held back on any rifting eruptions. But, then on the other hand you had the Eldgigur eruption of 1783, and those two are just a few kilometres apart, even though Eldgigur belongs to Grimsvötn fissure swarm. Maybe it happened under the glacier so the vent is hidden quickly. How long did the hole in the ice after the 2011 eruption take to close, if it actually has closed? It started to close almost immediately. After the 2011/2012 winter it was completely gone. The reason for it disappearing so fast is that it is lake water there, and that just needs to freeze over. Above a non ice lake volcano it takes a bit longer. If memory serves it took 3 or 4 years for Gjálp to be covered from glacial creep. Carl, I can’t see how this could be the case with Háagöngur. I’m not sure which one you’re referring to though. Can you link to the paper? Thanks Carl, nice post. Finally start to understand the larger system! http://www.dailymail.co.uk/news/article-5607963/Quaint-Devon-village-RISING-nearly-inch-year-scientists-no-idea-why.html . It’s that or the clotted cream mines are fermenting…. Wrong end of the country! Scotland rises, southern UK sinks. A shire-wide rise is too small. The whole area is ancient volcanics so I suspect it’s more likely to be seismic fault adjustment. Such small scale changes are normally due to water. A mine shaft filling up could do it. Water is always a good bet in Devon, it’s generally always raining! But with a natural cause? Ouch. Best solved by putting in many more geothermal drills. That will make the whole area go up rather than just the town centre and with luck should fix the cracks. Ah yes – A mystery! I noticed this the other day when i followed a link from a bbc news story http://www.bbc.co.uk/news/science-environment-43721223 to the interactive site and i wondered if one of our rags would try and make something it of it. It’s up the road from me here in Exeter and dead centre of that uplift area is a locally well known, meat processing plant/abattoir. It’s been there for the last century and was originally located to take advantage of the rail link to London. Given the length of time it has been in situ, i would not be surprised if there has been significant water abstraction during various periods of its history (cattle slaughter is a messy business) so rebound from that is where my money would lie if i was a betting man. However…. there are a number of other sites of significant uplift/subsidence shown on the map and they have all been explained in terms of post industrial effects (midlands coal mining, tube line extensions in London, etc) or geological features (slow land slips) so it’s curious that this one would remain unexplained? A Devonian volcano, or at least a young sibling to the Dartmoor/Bodmin plutons would be the mother of all black swan events! Pretty, isn’t it? But did you notice that the blue and the green are the same colour? Had to magnify it by 500% to convince myself, but yes, they are the same colour. I think the round earth is an optical illusion after seeing these….I am more than ever convinced its flat. Hi all! Infrequent poster, yet longtime lurker here. While Carl has been mentioning the possibility of a new subduction zone off Norway in addition to a new (silicic?) large igneous province, or LIP within the next 10 million years, give or take – a new subduction zone may be forming off the coast of Portugal, according to some scientists. This “proto-subduction” zone off Portugal (not Spain as the article says! )), as I’d call it, may have been responsible for the great earthquake of 1755 which totaled the Portuguese capital and largest city of Lisbon. Maybe one day you’d eventually have subduction all the way from Portugal/North Africa to northern Norway! That, of course, may not be so until at least 15-25 million years from now. Which means that volcanism could return to Ireland and Scotland in addition to Norway after over 45 million years of absence since the formation of the North Atlantic! Well the crust off the coast of that area is actually very old, formed around 150-160 million years ago during the late Jurassic. If subduction was going to start anywhere it would probably be there. I think there are areas of this Jurassic crust that are more than 7 km deep off the coast of Canada, maybe this is also on the way to a subduction zone. I have read that the Lisbon earthquake has been downgraded to a size that is possible without a subduction zone, but given that it happened 230 years ago and in the ocean it will probably be impossible to know exactly how big it was. The subduction might not spread south though, there is an existing plate boundary between Europe and Africa that might stop a developing trench. Likely it will intersect and form a triple junction. When and if that happens, the triple junction will migrate down one of the arms until it attains a stable configuration. Global Tectonics 3rd ed Figure 5.27 is a good reference. What it boils down to are the speed vectors of the plates at the fault boundaries. Examlle; When the Farallon plate went under, what was left were two triple junctions moving away from each other, leaving the San Andreas as the remaining boundary. The northern junction is the Mendocino triple junction, the southern one is at the Rivera microplate. The size of the Lisbon earthquake is actually fairly well known, at around 8.3. The precise location is less certain, apart from being in the deep ocean. Continental crust (and the continental shelf) can’t subduct. To sink into the mantle, you need material that is denser than the mantle. The continents are considerable lighter than the mantle so they float. Ocean floor is about the same density as the mantle, and as it cools and becomes denser is starts to sink. The first indication of this is that the depth of the ocean increases, and that may indeed be happening off the coast of Portugal (although subduction has not started there yet). When oceanic plates collide, in most cases one will go underneath the other (not invariably so: there is a counter example also off the coast of Portugal (see the post above). When continental plates collide, they make crumple zones (i.e. mountain ranges). 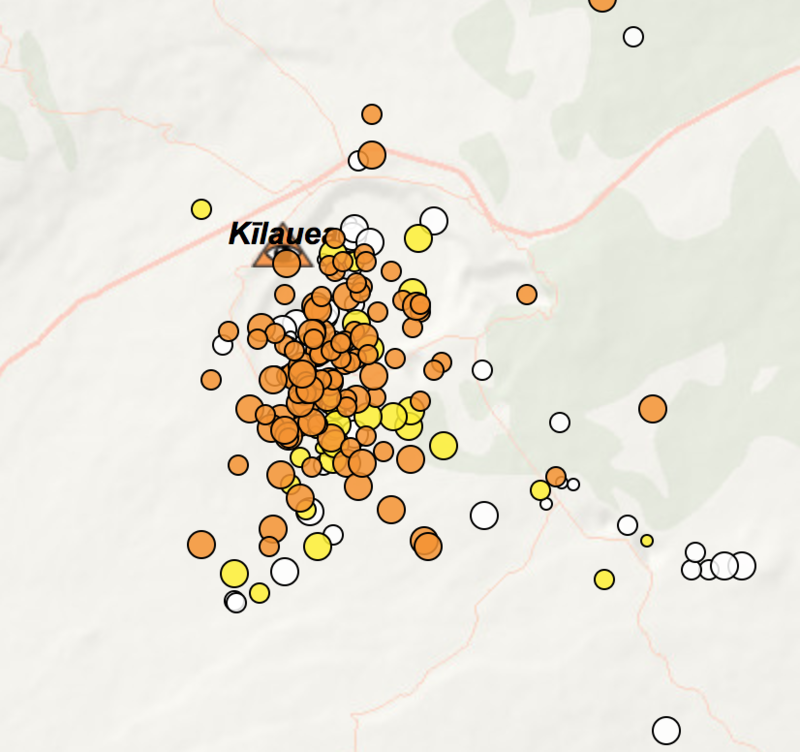 Just experienced my first earthquake, after some short detective work online, it turns out that an explosion at the quarry 6 km away, on the other side of the mountain, caused an unusually loud boom and shaking of the ground. I jumped up, thought a car had rammed the house or something. That’s what I thought when the paper mill exploded… but because it was the house and not the foundation shaking, I leaned more towards some sort of explosion. (Waste converter boiler. Burns black liquor to make electricity and recover chemicals for lignin digesting) It also augments their power usage and lowers their grid reliance. My first earthquake was a 5.5 at about 3 AM on 10 March 1973. The epicentre was about 50 km away near Nattai at the southern end of the Warragamba Dam in Sydney. One minute I was sound asleep and the next I was flat on my back on the floor next to the bed. It had quite a kick to it. Mine was an approx Mag 3.2 out in the middle of San Diego Bay. I was standing out in front of the apartment in Chula Vista. Until that happened, no one knew that fault line was there. Turned out, after investigation, that goes all the way up the bay and terminates near the airport. Ruminating on it afterwards, I think it is part of the Elsinore Fault system. 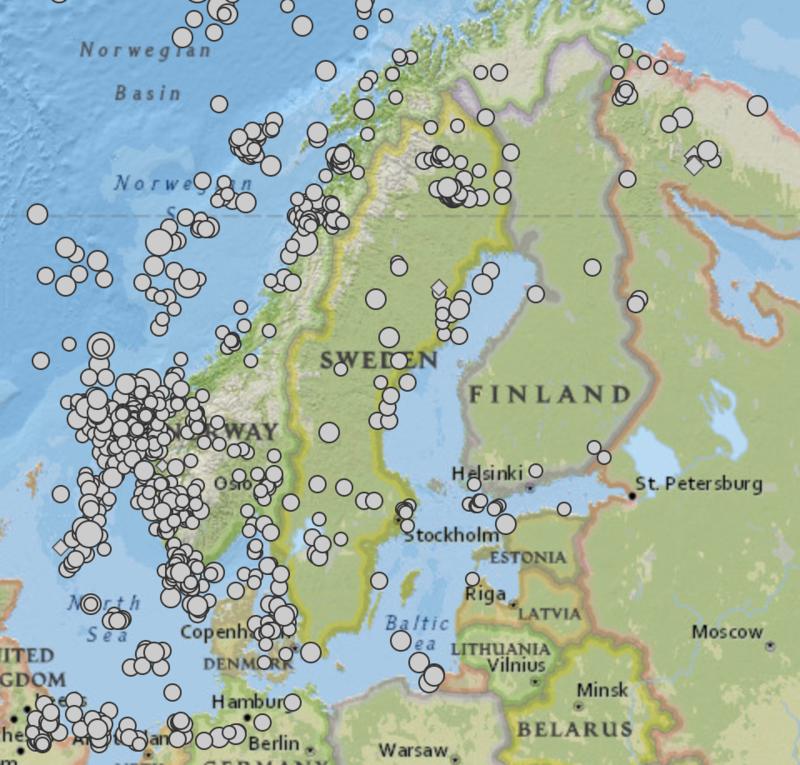 My first tectonic earthquake was from the faultline on the Swedish side of the waters between Sweden and Finland. The transform fault runs close to the coast, and at some places it even makes a landfall. In this case it was an M4.3 that happened near the city of Skellefteå. I then lived in Umeå, about 120 kilometres away from the epicenter. It felt like a very large truck ran by the house and after that came long period slow movements where I could feel the house bobbing around. The house I lived on was on a mudflat near the river, so not the best earthquake ground. 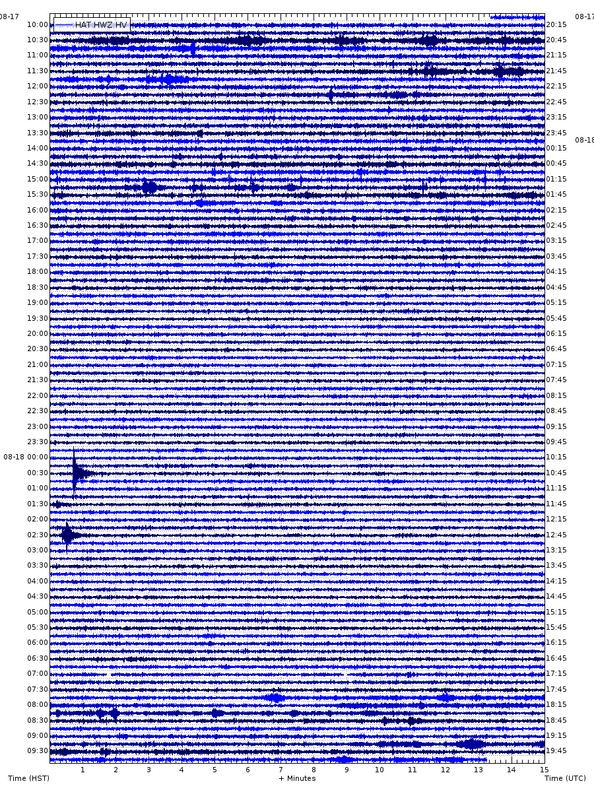 My first volcanic earthquakes was earlier at Sao Miguel in the Azores. My first was a small tremor in the North Sea which made the contents of the cupboards shake, I remember the brief noise, indeed as if a heavy truck had passed. A larger one in the southern parts of the Netherlands woke me up at night in Amsterdam. The biggest one was a M5.7 right underneath us in the Andes. That wasn’t fun anymore. It was at night and when I work I first thought that the noise was an underground train, until I remembered where I was. We have had a couple of earthquakes in Manchester as well. I should have felt that M5.2 2008 Lincolnshire quake but somehow I slept straight through it! My first earthquake was a 2.5, I was standing in the office kitchen looking out the window with a few other people because it had just begun to snow. Suddenly we all felt a bump. This being the East Coast, we didn’t think about an earthquake, our first thought was that a truck had hit the building, the next that a plane had crashed or a bomb had gone off. A few hours later we heard on the news that it was an earthquake on a fault that ran from Reading, PA down to at least the Potomac River where it disappeared under the sedimentary plain. It ran parallel to US29 which was about 2 miles away The earthquake was the first of a swarm of about 30 quakes over next month. The largest was a 2.7 that woke us up. What surprised me was how you could tell what direction they came from like a wave hitting a boat. 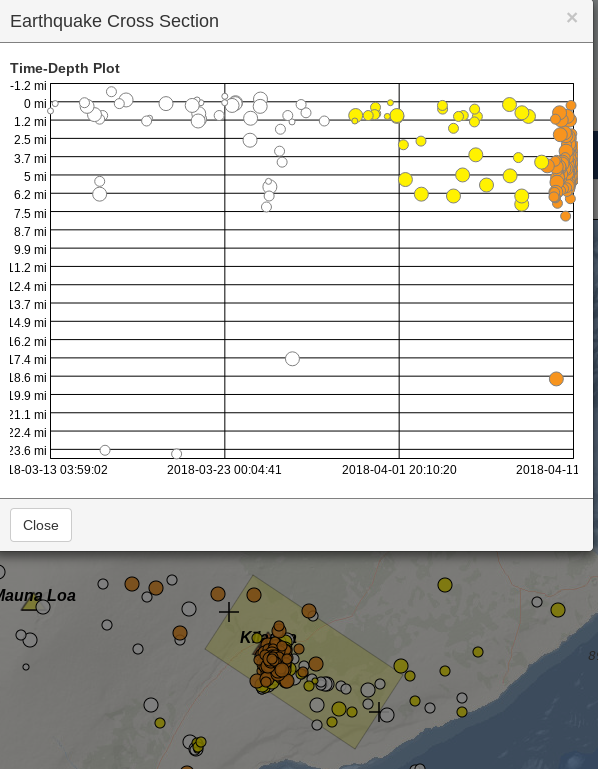 When the “big” East Coast earthquake hit back 2011, what surprised me was the noise. The building I was in was close to the transition zone between the piedmont plateau and the coastal plain and the building’s long axis was perfectly perpendicular to the seismic waves. As a result we heard a noise first that sounded like someone cutting into steel, it grew in volume and intensity until the whole floor began to vibrate in sympathetic resonance. After about 30 seconds of noise and intensifying up and down shaking, we finally guessed this was an earthquake and some of us got embarrassedly under our desks, thinking we were over reacting Then the side to side shaking started and that was intense for about 15 seconds. My kids immediately called me to say they had experienced the shaking about 10 miles away I was relieved that it was only an earthquake and not so sort of terrorist attack. Herdubreid stretching its legs a little. It seems a DI recovery taking it back to where it was a month ago. At the same time, the expansion of pu’u’o’o has further accelerated in the last few days. Something is going to give somewhere.. Given how stable the dyke to pu’u o’o seems to be by now, I wonder what actually could stop it (aside from total dormancy which is extremely unlikely at kilauea). Mauna ulu ended after a number of smaller fissures nearby and in the summit area started erupting, but 4 different separate eruptions and probably at least that number again of intrusions have happened since pu’u o’o formed in 1983, but activity has always resumed some weeks later. Actually, it wasn’t silent, just that monitoring equipment at that time was not sensitive enough to record the small changes before eruptions – until 1924 all they had to do was watch if the lava lake in halemaumau changed suddenly, and after that point there were no proper eruptions for a while so there was no incentive to upgrade the system. It is believed that there were several intrusions into the upper east rift in the 1940s and another larger one in 1951 followed by an eruption in 1952 and a subsequent intrusion further down the rift, both of which later erupted in the 1955 eruption along with new 1955 magma, and this dyke was still hot enough to allow magma to erupt in the same area in 1960. The period between 1934 and 1952 was similar to the period from 1984 to now at mauna loa. 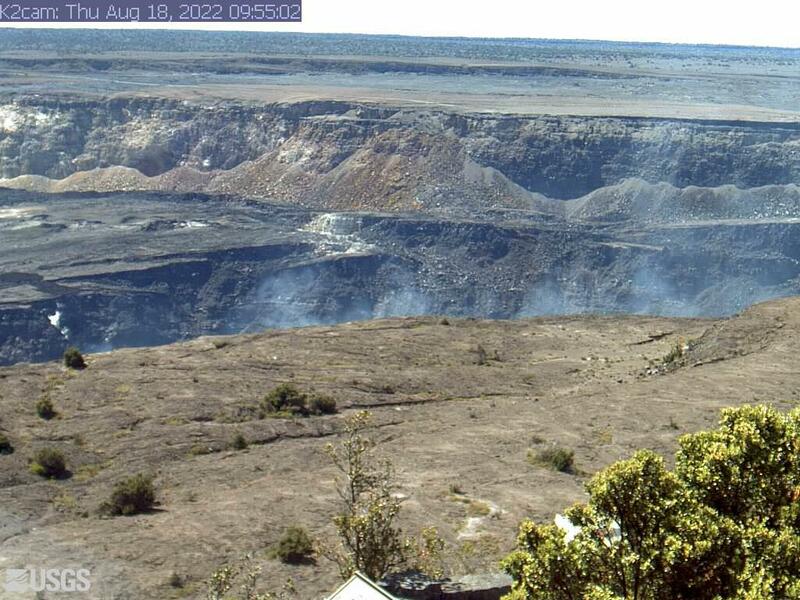 Mauna loa hasnt erupted at all since then but it has still been seismically active and is far from dormant. And a psuedo factoid for anyone poking around Gurgle Earth. Fault Zones tend to trace out tangential arcs to the rotation pole for the bordering plate. Trace out the segments 90 Deg to the fault zones and you should come pretty close to the Euler pole for that crust segment where they intersect. I have to go check on my brisket. BBL. Example: lines tangental to the transform fault segments in the gulf of California intersect near the Euler pole for the North American plate up in Canada. There are rigid motions in Euclidean space (any translation), and on a sphere (any rotation of the sphere). Are there any in a hyperbolic space of constant curvature? What is the minimum stress from such a motion? Euclidean translations are stress-free, while a plate rotating about its Euler pole would experience a spin gravity directed radially outward from the axis of that rotation, so would be under tension along those radii. That suggests any moving object in a hyperbolic space would also experience a nonzero minimum stress. I started working on a piece about the eifel volcanic field in Germany, which literally begins right in my back yard. I’d love to contribute it to VC when it is ready. Due to work and family, I do not know yet when that will be, if I’m honest. But I already have several day trips planned. Excellent, let us know when you’re done and we’ll schedule it in for publishing. The convention is that “magma” refers to molten material under the ground, and that once it reaches the surface it is called “lava”. This is probably more of a philosophical question, but in the case of a lava lake like the one at Kilauea summit, where does one draw the distinction between magma and lava? And would it make any difference to that distinction whether the lava lake is overflowing or not? Would lava sinking back down due to convection in the lake be considered magma again? Here’s my suggestion; magma consists of both a ‘refractory’ part (usually silicate based) and a ‘volatile’ component, gases and low boiing point liquids -eg sulphur- in solution under pressure Lava consists of merely the refractory component after loss of volatiles. Hence the material in Halemaumau is lava, and -since it doesn’t suddenly re-acquire its volatile content when carried down by circulation-, remains so. Does that sound reasonable? Dunno… that would mean the hydrothermal well in the region of krafla that trashed he’d a drill bit but did not erupt, was lava and not magma due to a lack of volitiles… yet never breached the surface other than what was stuck on the end of the drill string. I wonder what would be the case of when magma drains back into the vent and into the magma chamber. Most eruptions in pit craters end with most of the lava lake draining back into the vents afterwards, and I’m willing to bet that some of that ends up in an intrusion that later erupts (e.g. the 1959-1960 eruptions at kilauea, the 2007 eruption at piton de la fournaise, and probably every flank eruption in historical time from nyiragongo) Some of the lava erupting at the 61g vent was probably in the lava lake at the summit at some point, and so technically it has been erupted twice (unless the lava lake is only counted as an eruption when it overflows). Speaking of Nyiragongo, there is currently, (or at least recently, as documented in the One Strange Rock series currently airing) lava erupting from a spatter cone in the crater, running across the crater floor, and then down into the main lava lake. There must be some interesting plumbing going on to allow that to happen. A lot of the flat earth movement is satire though there are people who actually believe it and a larger number who take the satire seriously enough to think there is merit in refuting it.I’ve been having fun with the Silurian hypothesis (the idea that chemical signatures in ancient rocks that look like what an industrial civilization might leave are actually evidence of ancient prehuman civilizations) and threw out the question of whether the end-Ordovician extinction event could be taken as evidence that ancient cephalopods had sufficient cognitive abilities to anger their creator and bring down the wrath of the cephalopod God.